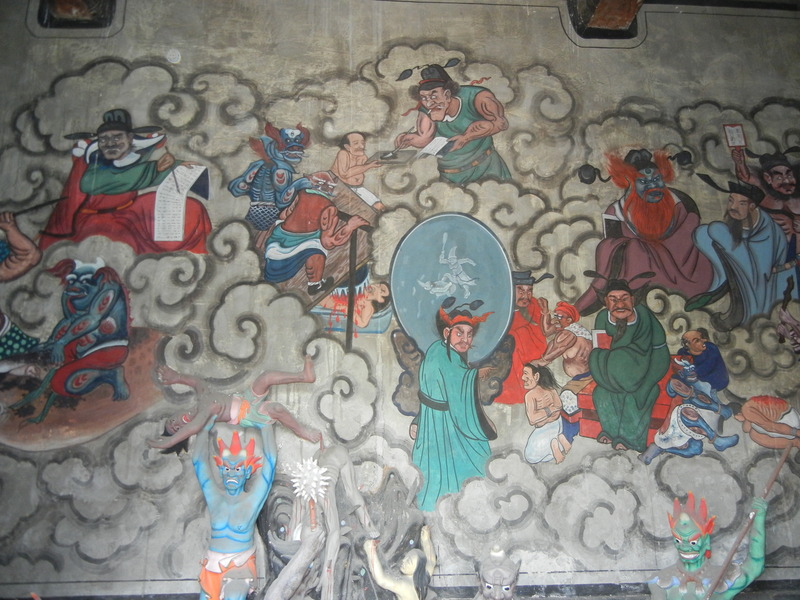 Unlike strict monotheistic faiths like Christianity and Islam, traditional Chinese religions have allowed many gods to rub shoulders. And with input from Confucian, Daoist and Buddhist faiths over the last 2,000 years, Chinese religious imaginations have worked overtime. Having lived in India, I was already familiar with spiritual imaginations creating a populated heaven. 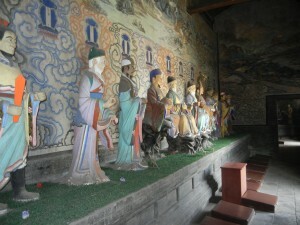 But China’s city god temples reflect uniquely Chinese ideas about Heaven and Earth, and how they’re linked. Governments in many of China’s dynasties relied on district magistrates. They oversaw tax collection, legal functions, and parlayed information back to the national capital. They also presided over social functions and rituals in their cities. They were like mini-emperors in their locales. The city god duplicated these functions in Heaven–Chinese saw the world above as a bureaucracy that reflected the central government. 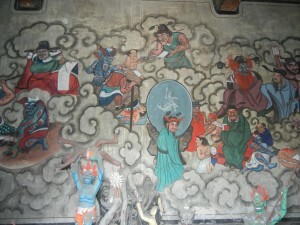 The city god worked with the district magistrate. 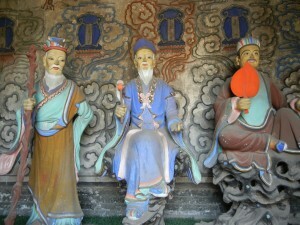 He ruled the invisible world (you), and his earthly counterpart governed the visible world (ming). Both were considered necessary for a harmonious cosmos. They reflected each other, so temples were designed after palaces. They had a courtyard and great hall (like the above temple in Ping Yao). And they had sleeping quarters that looked like the magistrates’. Did they get insomnia when they overworked? They rode in the same type of sedan chair as the magistrate, and had the same types of subordinates. 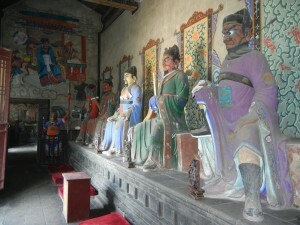 Though the ones in Ping Yao look more colorful. They were also numerous. The above hall was one of several. Some oversaw judiciary functions, like these dudes with ‘tudes. Their stern faces ensured that everyone remained orderly. 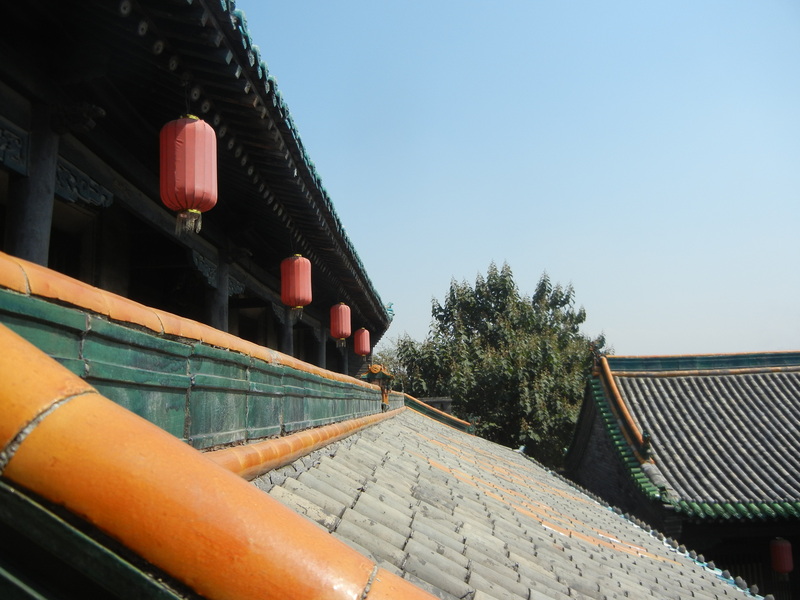 When a magistrate assumed his new post, he visited the city god temple to enlist his support. Folks celebrated the city god’s birthday with loud festivals that rollicked all over town. All turned to him for aid after natural disasters. Officials performed sacrifices to city gods, and went the extra li to ensure their happiness. 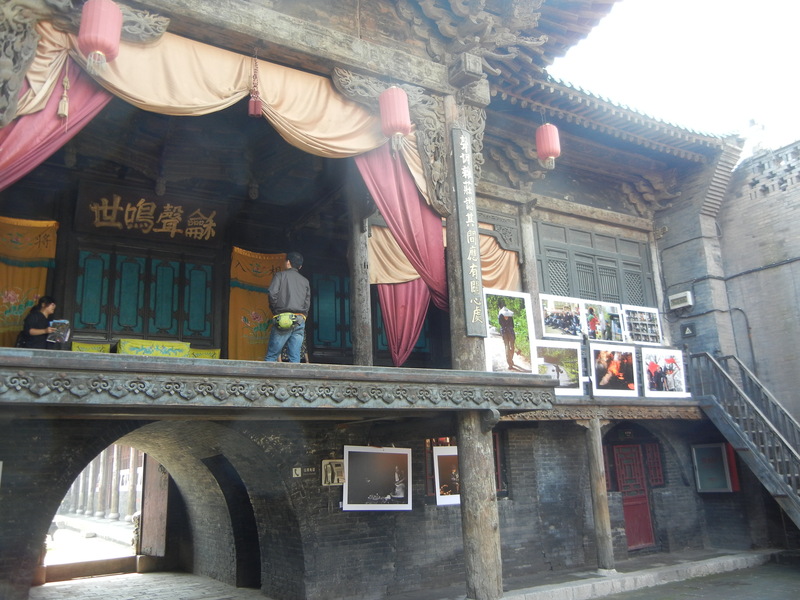 Yeah, that’s a stage in the same temple in Ping Yao. 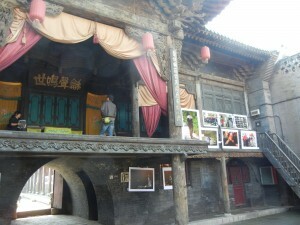 People performed plays to entertain their city god. 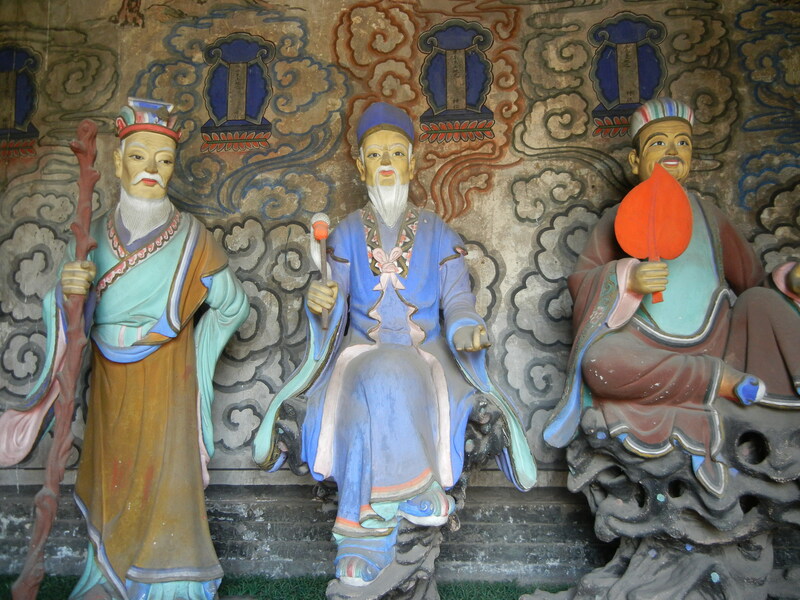 This trend developed during the Yuan Dynasty, and it was a major root of Chinese theater. 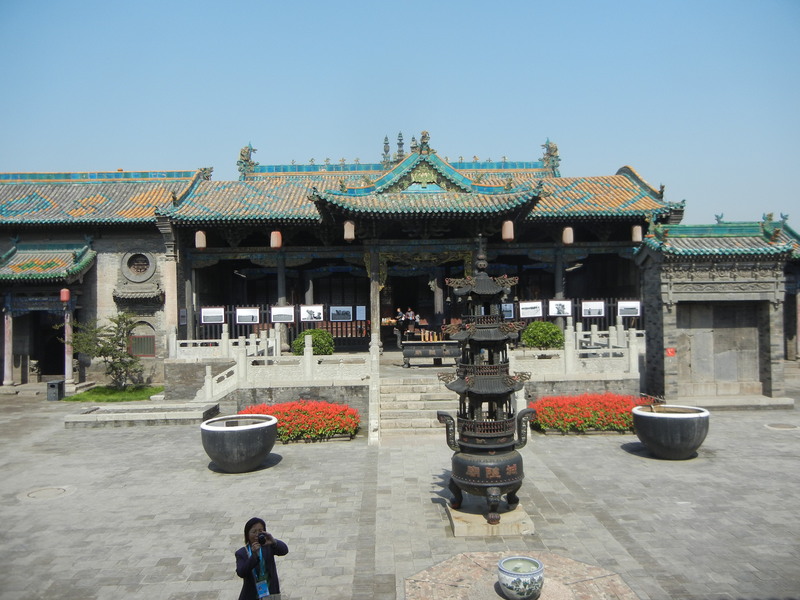 City god temples express a harmonious universe in which Heaven and Earth mirror each other. But this heaven is worldly. A single god who is too distant for humans to comprehend isn’t emphasized as much as a community of multiple spirits that resembles ours. Like Yin and Yang, both realms work together and their patterns influence each other, though the heavenly realm has a bit more. Is America’s congress following the spirits of Laurel and Hardy these days?